In the previous article, “Reading the Wind (Part 1)” we discussed the tactics and strategy needed to negotiate the wind during rapid fire (primarily 300 yards). The goal during rapid fire is to center your group in the 10 and X-ring. Your windage setting must therefore be a compromise between what the wind is doing at the beginning of firing time and what you believe it will be at the end of firing time. The 600 yard slow fire stage needs a slightly different approach and skill set to maximize one’s performance. The ability to “read” the conditions, coupled with feedback from your last shot, make this stage one of the most intellectually challenging in highpower competition. The basics of reading the wind still apply at the 600 yard line. Shortly after arriving at the ready line, you should determine the speed, direction and value of the wind. The first task, determining wind speed, has seen competitors arrive at the firing line toting the latest in meteorological marvels. I submit that the human eye and well-trained powers of observation are the equal of any overpriced anemometer (a fancy word for a “wind meter”). The following list of the effects of the wind and their corresponding velocity can be found in the 1931 Service Rifle Pamphlet produced by the US Army Infantry Team. The information is as relevant now as it was then. The direction must next be determined. 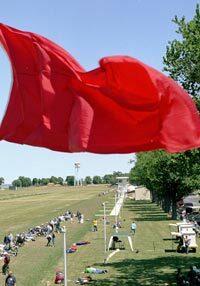 Flags are a useful utility in determining wind direction and value. 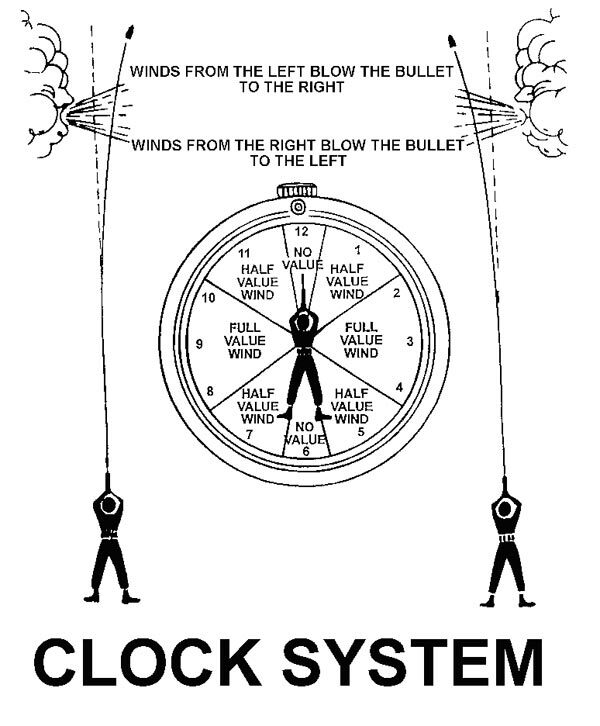 When discussing the wind, we use the “clock system”. The direction of fire is always “12 o’clock”. The following picture illustrates the direction of the wind and its Value relative to your direction of fire. The Value of the wind is as important as its speed when deciding the proper windage to place on the rifle. 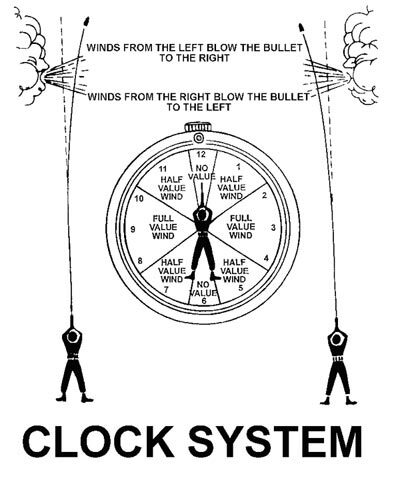 A 10 MPH wind from “12 o-clock” has No Value, hence it will not effect the flight of the bullet. A 10 MPH wind from “3 o’clock”, however, would be classified as Full Value. Failure to correct for a Full Value wind will surely result in a less than desirable result. The first question you must ask yourself is, “how much is the wind worth?” The effect of the wind on your bullet is a result of a combination of factors, such as: the caliber and weight of the bullet, its ballistic efficiency and the time of flight. I recommend the following, simple method. This method relies on knowing how much the wind will move the strike of your round at 600 yards, given a velocity of 1 MPH, at Full Value. For example, a 1 MPH Full Value wind will move AMU’s 600 yard ammunition approximately 3 inches at 600 yards. At 600 yards, 3 inches equates to ½ Minute of Angle (MOA). We will refer to this as our 1 MPH Constant. If you know the wind’s speed and Value, your initial estimate will be both quick and accurate. Furthermore, if the condition changes while you are shooting, you will be able to formulate a correction without stopping to consult your ballistic program and portable abacus. The Importance of a No-Wind Zero. This is the sight setting required to hit the center of the target in a “no-wind” condition. This zero is best determined at close range, on a calm day. Determination of the predominant condition. Wind will usually manifest a predominant condition with some variations. This condition and its strength (remember the 1 MPH Constant) are best observed prior to firing. The value of the strength of the extremes. When wind is switching direction during a string of fire, the strength of the extremes must be known. Again, this is best determined prior to firing. Distinguish the indicators available to you. Identify the upwind and downwind side of the range. The upwind flags are more important during firing, especially when attempting to discover an imminent change. Always know, with absolute certainty, how much wind adjustment you have on the rifle. If there is a pick-up in the velocity of the wind, attempt to think of its new value in Minutes, not with the mindset “that it’s a minute more than the last shot.” This will allow you to think of the wind condition in terms of its actual strength in Minutes of Angle. Critical thinking will result in a rapid improvement in your ability to read the wind.